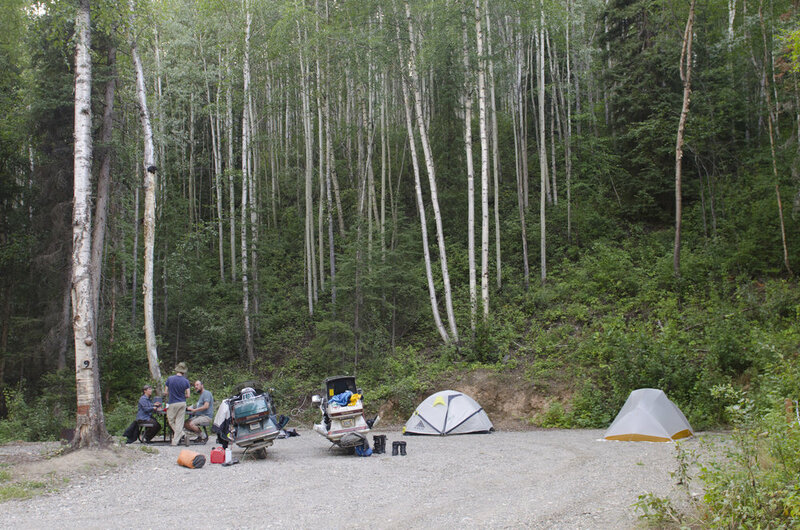 Liard River Hot Springs Campground: As the name suggests, this 53 site campground is the closest accommodations to the hot spring. In fact, you have to drive into the campground to reach the day use parking area and boardwalk to the springs. The campground is open year around and costs $26 per party per night or $16 per party per night in the winter. It features fire rings, pit toilets, potable water, and a playground. It does not have RV hookups. It’s a popular place and was completely full when we arrived, with RVs and tents set up in an overflow parking lot across the road from the campground. I couldn’t find much information regarding camping in the overflow area. About half of their sites can be reserved and the other half are first-come first-serve. Mould Creek Campground: If, like us, you find yourself out of luck getting a campsite at Liard River Hot Springs Campground, Mould Creek Campground is just 0.5 miles (650 meters) down the road and was a decent little campground. It’s fairly new and privately owned by a family that lives in the campground and has 10 very large sites and a few little cabins. At the time of this post, all they have is a Facebook page that provides almost no information, so I assume everything is first-come first-serve and have no idea how much the cabins cost. We paid around $20 dollars, which included free showers. 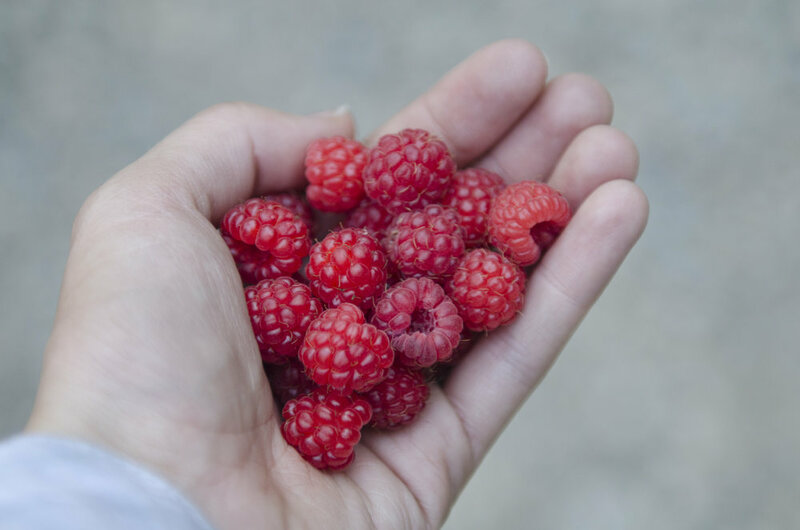 We were delighted to find a water spigot at each campsite and wild raspberries everywhere. That evening we decided to shower and discovered that it was a single shower in a little building near the entrance that included a kitchen with a sign indicating that only the host family were allowed to use it. There was a queue for the shower, but waiting wasn’t a big deal as there was a little table with magazines and some chairs. The bathroom itself contained towels and other items that indicated it was also used by the host family, which felt a little odd. At any rate, the water was super hot and the water pressure was amazing so we were very happy having not been able to shower for close to a week. The hot spring fee is surprisingly affordable - $5 for adults, $3 for children, or $10 per family, and if you stay at the Liard River Hot Springs Campground, it’s free! Keep in mind that fees are payable in cash only. We were a bit confused where to pay as we expected to find a fee box or person collecting fees at the actual entrance to the hot springs, but you have to pay at the staffed gatehouse at the entrance to the campground. I was at the gatehouse at 8:00 am when it’s suppose to open, but the staff were still setting up. After awhile one of the guys asked if they could help me and I said I needed to pay for the hot springs, to which he replied, “Don’t worry about it, we’re still setting up so just go on in” and that’s how we got to visit Liard River Hot Springs for free. There may be signage now, but there was no signage when we went. Fortunately, it was easy to find. When you enter the campground, head to your right passed the playground and you’ll dead end in a decently large gravel lot for day use people to park at. Pit toilets are available and the entrance to the boardwalk is obvious. It take 5 minutes or less to walk to the hot springs. If you don’t feel like walking to the hot springs in your swimsuit, there’s a lovely changing room on site and 24 cubbies outside on the deck where you can stash your things. There is no place to lock up items, so be prepared to keep an eye on your stuff or only bring things that you wouldn’t stress over should they disappear. We brought a towel, my camera, and clothes to change into after our swim. We noticed a couple of kids with masks and snorkels in the cooler lower pool, but I can’t imagine there’s much to see; the bottom of the pools are gravel and we didn’t notice any fish. I’ve read that the mosquitos can be terrible around the pools during the summer so insect repellent is recommended, but we didn’t take any and didn’t get any bites. I’m guessing they’re worse later in the day. There are two pools, one flowing into the other through two channels in a low wall that separates the pools. The upper pool is very hot but gradually gets cooler as you move toward the left. There are stairs into the water at both ends and the middle of the upper pool. I made the mistake of wading in on the far right and immediately felt like I was being scalded. If you’d rather ease in like me, head to the stairs on the far left. The lower pool was more like bath water temperature. 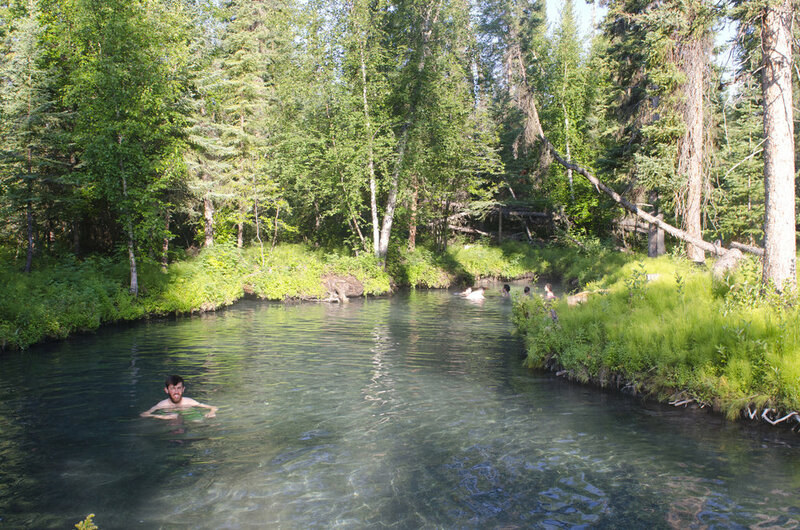 The Liard River Hot Springs Provincial Park website states that the water temperature ranges from 118F (48C) to 125F (52C). As mentioned above, both pools have lovely gravel bottoms and clear water and are about waist deep (except for the creek at the end of the lower pool) depending on your height. A deck runs along one edge of the hot springs and the other edges have been left in their natural state. There is only a very faint sulphuric smell. 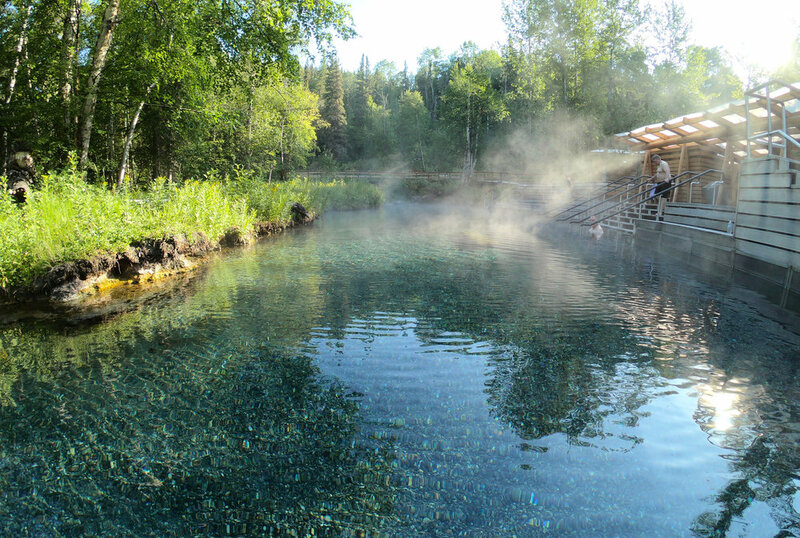 Liard River Hot Springs is open year around and is busiest during the summer. As such, many recommend visiting in the winter and say that you can see the northern lights from the pools most nights. Surprisingly, the pools are open 24/7 but the boardwalk isn’t lit, so take a flashlight if you go for an evening soak. As mentioned earlier, we headed to the pools at 8:00 AM and there were only a few other people there, so going early seems to be the way to beat the crowds during the summer. We left just after 9:00 AM and it was already quite a bit busier, although I wouldn’t say crowded.